It seems like every year I have a great little gift guide ready to go for Mother’s Day (I’m not above shameless hinting for myself), but usually slack off on getting something together for Father’s Day. Poor dads! I still love ya. And in honor of that, I’m really, really excited for today’s list of the top 10 gift ideas that would be fabulous for that father/father-figure in your life. These are fun. And don’t forget…down below the gift ideas, I’ve planned out a couple perfect Father’s Day menus, so if you’re shopping or cooking for the dad in your life (or your kids’ lives), read on for some inspiration! As always, none of these items are sponsored; just straight up awesome things we’ve bought or been gifted that we love, love (there are a few Amazon affiliate links scattered throughout – feel free to shop around!). Luminoodle: Let’s start of with perhaps the coolest gift in this whole list. Have you heard of luminoodle? Brian’s brother, Brad, introduced us to this nifty little gadget-thingy, and I tell you what, it’s been a hit (we’ve since gifted it to our own fathers as well as a couple siblings). It’s basically an LED light strip that you can take anywhere. Brian’s used his while camping, to investigate a broken valve in a narrow, deep pipe on our property (aaaannnndd, learned via the Luminoodle that the valve got broken thanks to four boys, who shall not be named, who threw rocks down the pipe), and various home improvement projects. This thing is cool. Be sure to get the battery pack with it. ENO Hammock: I love hammocks! And I know this gift guide isn’t about me, but…I love hammocks! And the ENO doublenest hammock is sweet. I gifted this to my dad last Christmas and he immediately hung it up between two deck poles (in the middle of winter in Montana) and reported on its awesomeness. Well-made, durable and super lightweight, this hammock is just calling to be napped in. Adidas Boat + Water Shoes: Brian got these shoes a couple months ago (actually, after his brother Brad was wearing them on a hike we went on together – methinks his brother Brad, the luminoodle lover, has some great ideas), and honestly, I had to tell Brian the other day that he probably should take them off to shower at home. He wears them all the time – not even just on the boat or in the water. In fact, he wore them to Disneyland while we were there (he would like to state, for the record, that he would highly encourage the wearing of socks if walking that far in them) and loved how lightweight they are. I think I’m going to snag me a ladies pair. Oh wait! This gift guide isn’t about me. Darn it. Pellet Grill: I’ve expressed my love about my pellet grill/smoker before, but let me state again – I love this thing so, so, so much. We’ve gotten rid of our propane grill and a couple other outdoor cooking tools, because this pellet grill is all we use. Brian and I cooked on this thing steadily through the winter, and we easily fire it up 3-4X a week throughout the year. It’s less expensive than competing Traeger-type pellet grills while still being high-quality, durable and totally amazing. If you’re looking for a big ticket item, this should be waaaay high up on your list. Lazy Prizm Glasses: I swear these are not a joke. And right now, I’m thinking I should dedicate this gift guide to Brian’s brother, Brad, because these glasses were found by way of him, too. Brad gave Brian these glasses a few years ago at Christmas. I kind of thought it was a gag gift until I remembered how seriously Brian and his brothers take their duties to fat-dog it to the tune of SportsCenter once in a while (and by once in a while, I mean every night). Basically, these glasses mean you can watch TV (or read, but let’s be serious, it’s all about the TV) while laying down. You look like a complete dimwit while doing so, but you won’t care because YOU CAN WATCH TV WHILE LAYING IN YOUR SUPER COMFY BED, and you won’t have to strain a single muscle, not even your eye muscles. What have we become? Who cares. It’s awesome. Coolibar Rash Guard: My love for all things Coolibar started after so many of you recommended the products in the comments of my skin cancer post. I have several of their hats and a head-to-toe swimming suit (I’m so fashion forward), but since this gift guide isn’t about me (ahem), let’s talk about Brian’s Coolibar rash guard. It is pure, lightweight, looking-good function. Between this, his swimsuit, and those shoes mentioned above, Brian basically has his whole summer wardrobe nailed down and is thrilled he didn’t even have to get off the bed or take off the TV glasses to get to this point. Online shopping for super fashunable peeps for the win. Crank Brothers Multi-Tool: This little baby is getting wrapped up for Brian’s Father’s Day festivities this year (after my brother, Jed, told me he was sure Brian couldn’t live another Father’s Day without it). This miniature, heavy-duty tool does 19 things (19 things!) and basically has me thinking (hoping?!?) it can probably fold the laundry, too. Except of course I’m not really thinking that because this gift guide is about Brian. Not me. Handy, handy, that’s what this tool is. Kooba game: A Christmas gift for my dad several years ago, Kooba is still a very popular game to play at my parent’s house for kids and adults alike. I love games where the learning curve is short. That doesn’t mean I’m good at this (I’m not, but Brian is, and I’m happy for him – unless he beats me). I’ve learned there are two groups of people in this world: those who are really good at slinging targets at the wall with two poles…and those who aren’t. Luggage: I know, I know, luggage is kind of a yawn item, but it gets a pass this time because this awesome carryon is fantastic and perfect if your father-person is a traveler who needs a bit of a luggage upgrade. Brian had soft-case carryons for years and years, and this hard-case luggage is about a million times better. Plus, it’s just more fun to use. Booms Fish Alarm: Oh hey there. Let’s end on another of Brad’s recommendations, shall we? As an avid fisherman, Brad insists this thing has revolutionized his fishing life…he’s even been known to doze off while fishing for catfish only to be gently awaken by this alarm all in time to still reel in his catch. Now if only he had a hammock to doze off in. Now, let’s talk a little Father’s Day food! 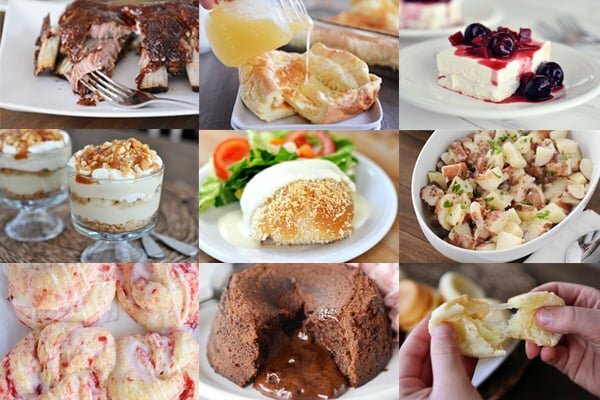 Here are three simple but delicious menus that would be perfect for Father’s Day! I’m drawing straight from the files of Brian’s favorite meals and desserts; he assures me all of these are winning combinations. I will say that two of his new favorite desserts (so amazing, they defy logic) will be posted in the next couple weeks so keep a lookout for them (they’ll be hard to miss!). Just wanted to let you know I LOVE your gift guides and have purchased many a successful gift over the years with them. So please keep them coming! Erin Condren life planners. The blue track for the matchbox cars. So many great board games. This time I bought my husband the hammock and he loved it/was so surprised since he never mentioned wanting one “but had been looking at them for years”. Yay! Thanks Mel!! I love that, Amy – thank you! Love the suggestions, I purchased the hammock for my father, he is going to love it. Thanks for all your great suggestions as always, you never disappoint. BTW: your sheet pan brownies— BEST THING EVER. My hubby said they were the best he has ever had. Hey Emily. Mel doesn’t have access to internet right now so I’m helping her out with comments for the next few days. She will be so happy to hear that you loved the hammock and the brownies! Can I just say that you are my FAVORITE?! Seriously! I LOVE all your recipes. And these gift ideas are FANTASTIC!!! Thanks so much, Mel!!!! Hi Mel, I bought the hammock for my husband bc he has been wanting one forever, but I am wondering if I need to purchase separate straps and if so which ones? Thanks! Just ordered the shoes… they will be perfect for the few camping trips we have planned for this summer…. thanks the great idea! me thinks I should buy them for the entire family, and ban any other shoe from coming out of the closet for the next 4 months… they look like you can wear them anywhere! Thank you! I just got the illuminoodle and the water shoes for my hubby. He has several backpacking trips coming up and we’re going to Lake Powell in July, so these will be perfect! What length of luninoodle would you recommend? Amazon defaults to the 5′, but that seems kind of short. Greetings from Green Bay! Thanks so much for the great Father’s Day ideas. I’m always at a loss and these are some awesome ideas! Yes, you are the best! Seriously Mel, you never disappoint! I just bought the illuminoodle for my husband and am considering a hammock. He’d pretty much love everything on this list. And thank you for turning me on to the Peaceable Kingdom games from your holiday list. They have been a huge hit with my four boys!! Thanks, Andria! I have a couple other games I can’t wait to recommend! My husband gets a hook up on camp chef stuff and was asking me if I wanted a pellet grill the other day! But his friend told him we’d be better off with just a regular grill. What’s your opinion (since yours matters more )? Does it replace a regular grill? And I love being able to use a skillet outside. Does this have a skillet burner? Thanks! 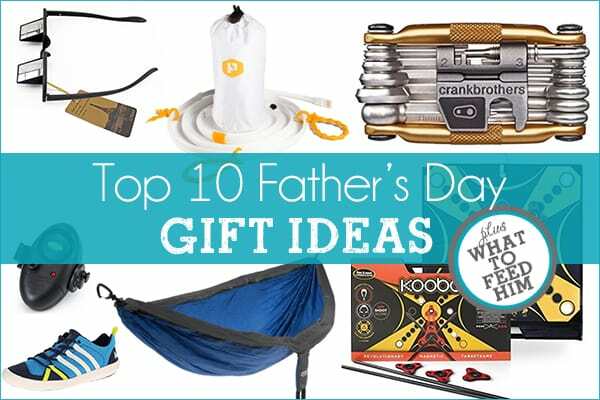 Best Father’s Day gift list ever for a husband who would laugh if I got him ties, socks, or cologne. I’ve never had a regular grill fancy enough to use a skillet on. 🙂 And at least the model of pellet grill I have doesn’t have a skillet burner (although I think they sell an add-on that hooks to the side for a ton of other cooking potential). I got rid of both our other grills after only exclusively using this for months and months. I’m sure everyone has a different, valid opinion but I’ll never go back to regular ol’ propane or charcoal grilling because I love the pellet grill so much (the main disadvantage is that it is, of course, electric, so you have to have a power source which limits being able to take a grill to the park and things like that – and of course it requires pellets so if you are out of those, you can’t grill). If you get the prism glasses, get more than one pair—that way you can let your kids have races and obstacle courses! Great ideas and of course delicious food! When I read “you look like a complete dimwit while doing so”…I laughed out loud (at work)!! Just ordered a Coolibar shirt and discovered that there is a 20% off sale with a free sun hat. SWEET! Thank you for this! Also, you are hilarious. My husband had really been wanting one of those smoker grills! So with your recommendation, I think I just might do it! What are your favorite recipes/things/ways to grill on it?! Thanks as always! Hey Natalie! I honestly cook everything on it that I would make on a normal grill: steaks, chicken, any of my grilling recipes on the site, hot dogs, hamburgers. The flavor is outstanding with the pellets! I’ve also smoked a couple things on it, too (turkey, brisket, ribs) and the smoker aspect is phenomenal. There are different settings on the fronts – different temperatures for basic grilling as well as smoking settings if you want it high or lo smoke. Can’t say enough good about it! As I mentioned to another commenter (Marci), the only disadvantages for me are that it is electric so you have to have a power source and because it requires pellets for heat, if you are out of those, you can’t grill. We LOVE our pellet grill. I like that it doesn’t take as long to heat up as a charcoal grill. It takes about as long as a gas grill, but has the amazing flavor of charcoal! We use ours ALL THE TIME 🙂 Great list Mel! Thanks for the great list! I do have a question – the prism glasses picture shown in your post are not the same ones that I’m taken to with your link. I’d love to buy them for my hubby but am not sure which you recommended. Thank you! Thanks for the heads up, Lindsay! I just fixed the link – but either of those options are good (I’ve bought them from both places). I love it when you put the menus together…thank you!! I must be living under a rock, because the only things I’ve heard of before are the luggage, hammock and grill. Thanks for enlightening me! I need to show that Luminoodle to my hubby.